Ebony Maw, Ronin and of course Thanos for me! I need to see the movie before getting Quantum suits. I also hope Hasbro will make an infinity War Hulkbuster first. A War Buster could be cool but only if it's used in End Game. I'll keep this pack staying far from home. Hi, This is not a Marvel Legend figure but there is more hope for those who expect a Ronin from Hasbro! Seen on facebook. Hi there, I did the spread the message on my Tweeter Account (JSDijoux). There are still MCU first ten years packs I don't own. This could be a good opportunity to complete the collection! Thanks! I agree with the inevitable re-use of Cap and Iron Man. 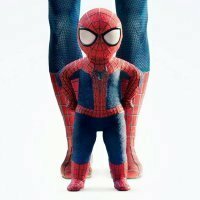 The previous Spider-Man figure will be re-used and get the missing spider-arms. We need a new Hulk! An outrider would be welcome too! The quantum realm male and female bodies could be used for army building. One figure and multiple heads, I'd be ok with that. Hi there, I was looking for cheap Marvel Legend doubles on Aliexpress and found this : The original link is here : https://fr.aliexpress.com/item/Personnalis-6-Stan-Lee-Action-Figure-Head-Lunettes-Body-Base-1-12-1-12-Moedl-Poup/32954277905.html?spm=a2g0w.search0204.3.31.7dc110330Ooja0&ws_ab_test=searchweb0_0%2Csearchweb201602_5_10065_10068_319_10892_317_10696_453_10084_454_10083_433_10618_431_10304_10307_10820_10821_537_10302_536_10902_10843_10059_10884_10887_321_322_10103%2Csearchweb201603_6%2CppcSwitch_0&algo_pvid=62644758-4b23-4851-b160-55716d780e37&algo_expid=62644758-4b23-4851-b160-55716d780e37-4 That figure looks good but it has hinged hips It re-uses the body of McFarlane Stranger Things Mike. I edited my message because I found details later. So this is not a Marvel legends, sorry. Less than two weeks ago, a friend of mine found some at Walmart in Boston. I got them today, now I hope a second wave will be produced! I do collect movie figures and I'll get them online because they would never reach French toy stores. I was expecting hasbro to re-use previous Ultimate Fury's body but it is fine for me. Still, I would like to get better pics of them. Now I'll have to wait for a better deal because I can not afford Shipping from Toy Wizz. Then, getting Red Skull, Hydra soldiers, Bucky and Dum Dum Dugan would be top notch! sorry for the double post. This one needs to be removed. Great news I am waiting for their release. Now I wonder if we'll get more movie characters. It's really sad we didn't get 6" scale Abomination, origins Sabertooth, Whiplash, Hammer drones, Black widow... The more movie figures I collect, happyer I get. About time! I've been waiting for this one for years! I'd be happier if this one had the same head as the movie video game hulkbuster armor. Whatever, I'll take it. Hi, got mine last week and they rock hard. War machine steals the show. I found a 6" suitcase armor version too, still waiting for it. Now I wonder, will we see 6" Black Widow, Nick Fury, Hammer drones, Whiplash mark I and II? What about that Tony Stark prototype? By the way, army building with hammer drones could be "profitable" (right word?). I can imagine drone variants as seen in the movie. I really miss the time when we had characters from Spider-Man like MJ, JJJ, Norman Osborn, Peter Parker. Iron man 6" series could use Pepper Pots, Obadiah Stane and even Happy Hogan. Hi, I've seen it too. Looks like a new 6" Iron man 2 tony stark figure! That is definitly not 3/4" or the Marvel Select one (the pannel says Hasbro) Finally dudes, my dreams come true I hope! If not then I will get the Marvel Select one. Did you notice the chest plate has the round "reactor" not the triangle one. Is it a MK4 or MK5 armor? I wonder if Tony's sunglasses will be removable... Have a nice day! What Large Characters Would You Like To See Made Into A 7" Marvel Select Figure? I would like to get a Movie Abomination figure.